After wondering for several years why American researchers know very little about German census records, my good friend, Dr. Roger Minert, found an opportunity to live in Europe for six months to investigate them. He was sure that many existed, but he could find very little information about them. While in Europe, he learned that even German researchers know very little about their census records! How could such a potentially important resource be lost to obscurity? 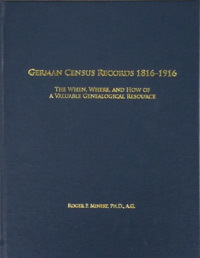 In a new book, written in English; researchers can now learn where and when German census records were compiled, as well as why and how. The author also describes state by state the content of census records and explains how surviving census documents can be located. This is groundbreaking information, of enormous value to anyone researching their German roots. Note - this book is also available in a softbound edition. Click on this link to be directed to that page at the FPRC website.